When you plan your holiday, you look for an interesting time to be spent, relaxation and enjoyment to be had and a place to stay where you can unwind and shed away all the stresses and tensions of everyday life. And that is exactly what The Lodge will be for you! Being one of the top hotels in Mcleodganj, you can look forward to nothing short of the very best of everything from us. And we promise to deliver to each and every one of your expectations. With the most modern facilities, cozy rooms, an amazing view, great food and all the worldly comforts available for your pleasure whenever you need them, your vacation will only get better and better. And when in a place as scintillating as Mcleodganj, you will be hard put to find anything better than this! The Lodge is conveniently located at Dharamkot at a distance of 1 km from main town Mcleodganj (away from the busy street of the town, in the open environment) which gives added advantage to the tourists. Our Hotel is a four storey marvel of modern architecture where homeliness mingles with professional ethics in Hospitality. You can enjoy a majestic view of the Himalayan mountains and the pine forest in the vicinity along with a comfortable and relaxing stay. What more can you ask for! So tell us what you want from your holiday here and we will make it happen for you. From adventure to relaxation, from shopping to pampering yourself, from exotic food to simple nature enjoyment, The Lodge will manage it all for you! When you are in a place as beautiful as Dharamsala and Mcleodganj, all you need is serenity, peace and time to relax and become one with nature. And The Lodge is equipped with everything to offer you exactly that! There can be nothing better than enjoying a calm and quite sunrise with the mighty Himalayan mountains in front of you and all the exotic birds chirping away in the pine forest surrounding your balcony. The Lodge is perfectly placed to offer you this amazing experience, coupled with the majesty of Mother Nature all around you! 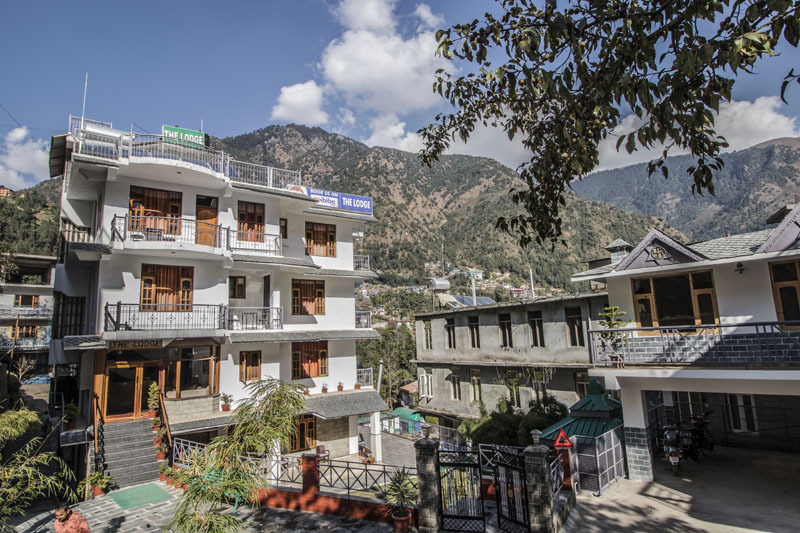 Away from the hustle and bustle of the city, this luxury hotel in Dharamsala is conveniently located in a way to ensure you get up close and personal with nature and enjoy all of its charms. The Lodge is one of the handful of good resorts in Mcleodganj and Dharamsala that can proudly boast of providing its customers with the most modern amenities for their comfort. The hotel is equipped with all the modern facilities. Each room has attached Bathrooms with hot and cold water running 24x7. Guests will also be treated with LCD TVs in their rooms complete with Satellite channels. We also provide EPABX facility, 24x7 Room Service, Parking Area, Drivers Room, Doctor on call, Camp Fire facilities and a Private Lawn for your pleasure. What more can you ask for! If there is one thing that always becomes the highlight of any travel expedition, it is the food. And in Dharamsala, The Lodge will provide you with a dining experience you will always cherish. Our Multi Cuisine restaurant serves delicious & hygienic food right to your rooms! Trust us, our delectable dishes are good enough to remind you of your home and your mom’s cooking! The Lodge does have every aspect of your dream vacation covered. Call today and book your picture perfect holiday with The Lodge.